At the end of my previous post I said what I really admired about those libraries that are putting themselves out there: guts, initiative, energy and imagination. I’m really impressed with what Sophie has done in a range of recent posts about Information Literacy and the future of libraries. She has sparked lively debate among her colleagues inside UTS and also in the broader library community. Sophie is a staff member I will fight to keep. [There are several others but this post is about our Soph.] Why? Well for a start because she has and uses all of the qualities I outlined in the first sentence. However, she goes a little further because of her artistic background. She is creative. Originally and artistically creative. And that means she has these special powers: the power of original thought; and the ability to express or share those thoughts. The truly artistic people among us (like Sophie) are not afraid of expressing their original ideas. And I think most of us in libraries are afraid. We sometimes lurk about waiting for others to say something original and then jump in with our criticisms. They are not always that constructive or helpful. It is easier to do that than come up with something original. I am not having a go at those joining the debate on Sophie’s posts, that is something different again. That debate, however, would not have happened without her original post. In one of those Team Management Index things I was described a couple of times as a “creator-innovator”, but I don’t think it was at all accurate. I’m easily bored which is consistent with the full description (from memory), but I’m just not that original and I’m probably more of an “explorer-promoter”. Our “teams” in libraries need their share of true creator-innovators like Sophie because they inspire all of us and make our life at work more interesting and enjoyable. I can still hear her saying to me at VALA earlier this year: “Be a joiner-in Mal!”. It made me laugh and I did join in. 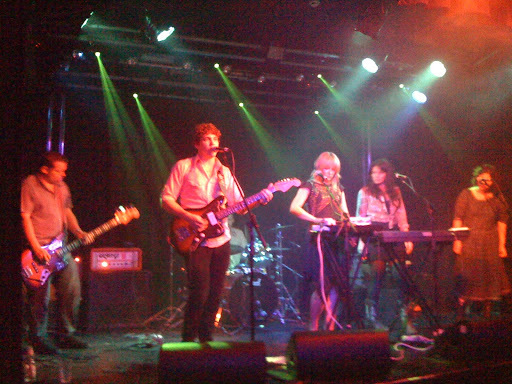 The crappy image above is Sophie on stage at the Oxford Art Factory in Griffith Goat Boy. All I had was my iPhone. I love this. Sophie we all appreciate you – your engagement is infectious. I'm more positive about library discussions than I have been in years, even if it is to present the pessimistic point of view : – ) What I also love is the way Mal you have shown the value in allowing different approaches and backgrounds to be fostered within the role of librarian. Benefits both the creative and the action focussed amongst us. I feel sometimes that the mutual growth & learning possible between different styles is just not recognised in librarianship. It's either take on a star role as an individual or join group style of the majority. She's away today – who's going to keep me entertained????!!!! That's deep. Way too deep for me. I'm just envious that such creativity is valued in your library. So I'm finally here to comment. Wow Mal, thanks for such high praise. I really appreciate how supportive you are and I recognise that to feel so valued by your management is a rare thing. I think I've always been creative in my work but I haven't always been so valued. Creativity thrives with trust, freedom and encouragement. Thanks to you and others at the library creativity is alive and well.